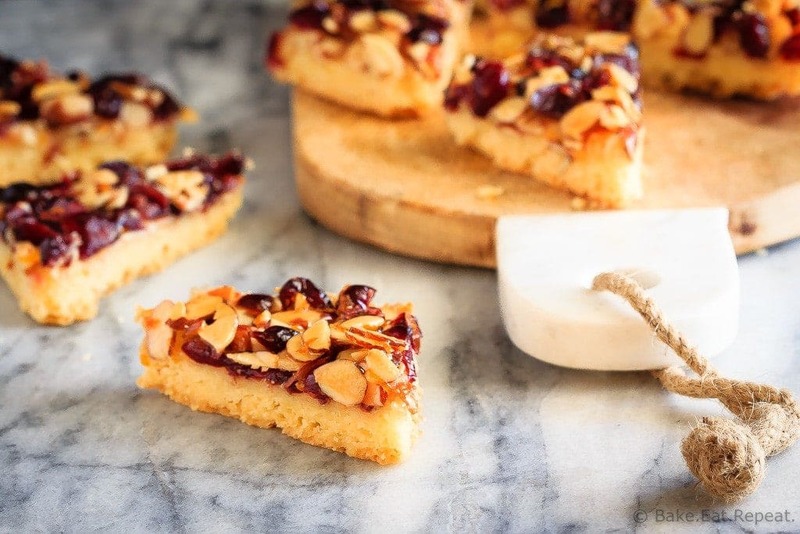 These glazed cranberry almond bars are the perfect addition to your Christmas cookie tray. Pretty, festive, and so easy to make, everyone will love them! Disclaimer: This post has been sponsored by Natrel and I have been provided with product and compensated for my time. All opinions are, as always, my own. Ah, Christmas baking. I believe I do far too much of it. Hopefully I’m not the only one with a freezer full of baking right now! Baking is definitely one of those things that I look forward to doing every single Christmas season though. There are so many treats that I love to make every year, and only make at Christmas time, so I really enjoy doing all that baking. It’s the one time a year that I use sugar and butter with abandon and don’t feel even a little bit guilty about it! So I was quite excited when I was given the opportunity to take part in Natrel’s holiday campaign to spread joy this year – Natrel’s Greatest Dessert Exchange. Come up with a Christmas dessert recipe using one of their new butter products (organic and lactose free butters) and share it with someone? Yes, please. 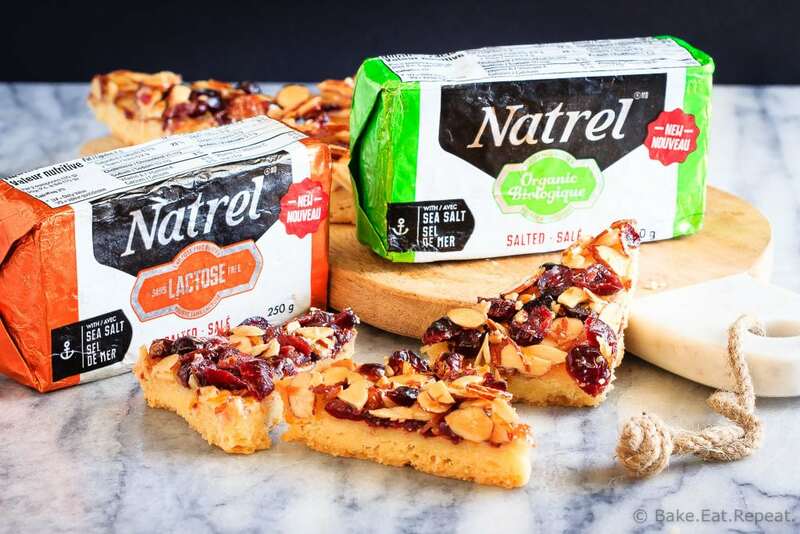 Both of Natrel’s new butter products are made with only two natural and high quality ingredients – cream (either organic or lactose free) and sea salt. The lactose free butter is the first one of its kind available in Canada. You can find it in stores in Quebec, Ontario and the Atlantic provinces. You can find the organic butter in Quebec and Ontario. 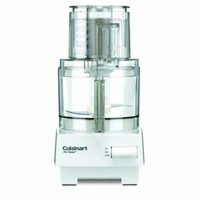 It only uses cream from dairy farms that follow organic farming principles. I loved both of these butters, and enjoyed baking with them. As I said, I love baking at this time of year, and I love giving that baking away too. My kids teachers can pretty much always expect homemade food gifts at Christmas, and baking is inevitably what I bring to every single Christmas party or gathering of any kind. It never even occurs to me to bring something else! These glazed cranberry almond bars have been percolating in my mind for about a year now. I am so glad that I finally created them! 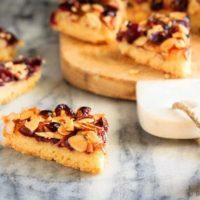 They have a buttery shortbread base covered with dried cranberries and sliced almonds in a sweetened, orange flavoured glaze. 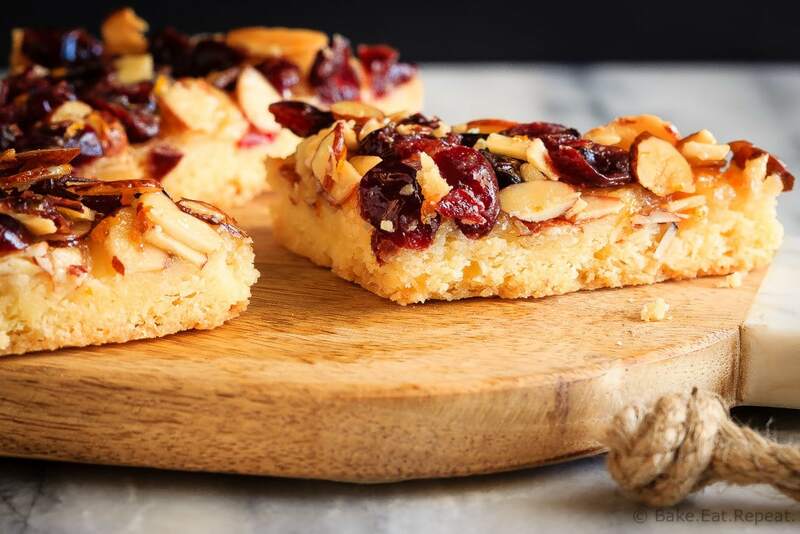 These glazed cranberry almond bars are absolutely amazing and super easy to make. They’re a great way to spread some joy this season! Preheat the oven to 350 degrees F, and line a 9x13 inch pan with tin foil, leaving an overhang so you can lift the bars out with it. Spray the foil lightly with non-stick cooking spray. 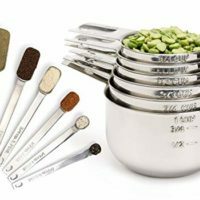 Press this mixture into the prepared pan, pressing it firmly with your fingers into an even 1/4 inch layer, and up the sides of the pan about 1/2 inch. Refrigerate for 30 minutes and then bake for 20-25 minutes or until lightly browned. For the topping, combine the butter, honey and cream in a medium saucepan over medium high heat. Bring to a full rolling boil, stirring constantly, and then remove the pan from the heat. Stir in the almonds, cranberries and orange zest. Pour the topping over the warm crust and spread it out as evenly as possible. Bake for another 12-14 minutes, or until the topping is lightly browned and bubbling. Let the bars cool completely before lifting them out of the pan with the foil and cutting them into triangles. Oh, these bars sounds right up my alley! :) And that buttery shortbread base! Yum! These bars look so delicious. 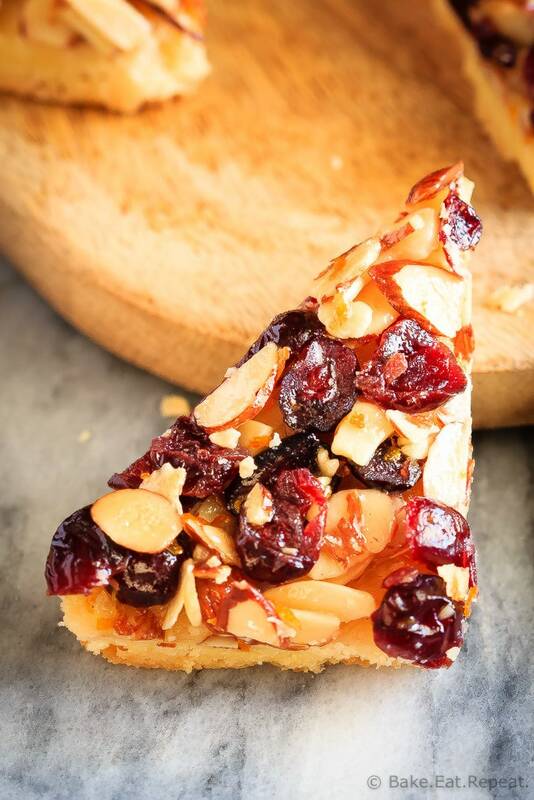 I love a cranberry almond combo, and the flavor is perfect for the season. 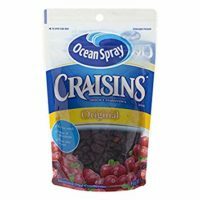 What a delicious gift idea - I love the flavors! I use butter and sugar without shame this time of year, too, and it's so darn good. 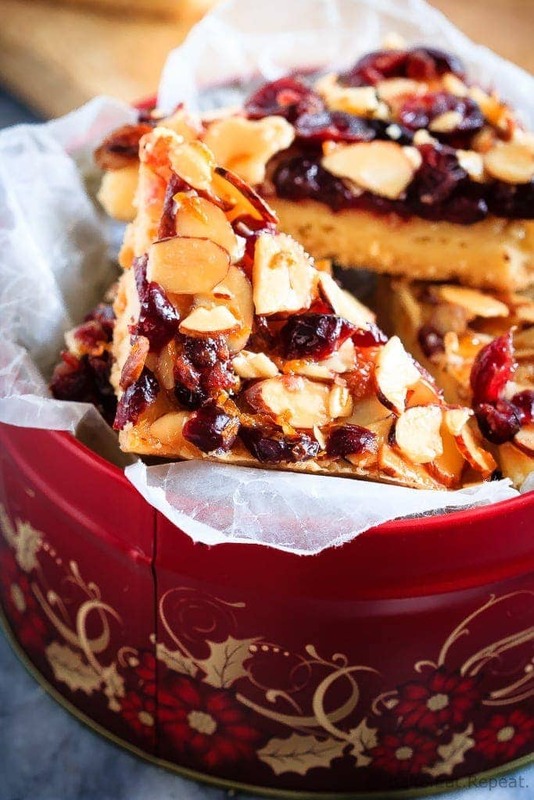 I absolutely LOVE the sound of these almond bars - so festive and delicious! These look absolutely delicious. Natrel is a new product for me and so far I truly like what I see! These bars look scrumptious! I can't wait to make them!